Dr. David G. Bogard earned his Ph.D. in mechanical engineering from Purdue University in 1982 and joined the faculty of The University of Texas at Austin that same year. He is affiliated with the Thermal/Fluid Systems research program. 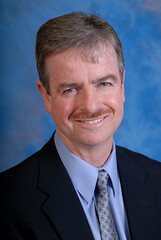 Dr. Bogard currently directs research programs in turbine blade cooling and advanced drag reduction techniques for turbulent wall flows. In April, 2002, Dr. Bogard was named the Outstanding Graduate Advisor at the University of Texas at Austin. He has published more than 130 technical articles and reports.